Keep up to date on the latest holistic veterinary therapies. Learn how acupuncture can improve your horse's life, boost performance and maintain health. Chiropractic is a therapeutic modality that addresses a horse's biomechanics. Ensuring that all of the joints in a horse's spine are moving well allows the horse to move freely through his body. During a chiropractic treatment, the doctor takes each joint of the spine through its range of motion to evaluate the quality of movement. If a restriction is identified, normal movement is restored to the area with a very precise, quick thrust along the plane of the joint, called an adjustment. Many people use the word “out” to describe these restrictions, such as, “my horse's neck was out.” However, the bones are less often “out of alignment” than they are “stuck” within their normal range of motion. For example, one of the joints of the neck vertebrae may move better as the horse flexes to the left versus the right, even though the bones are not visibly displaced on X-rays. When a horse has an area of the spine that is “stuck,” another part of the body will need to move more to compensate. This excessive movement causes increased stress on the tissues, which can result in pain and degenerative conditions if left untreated. So how do you know if your horse needs to be adjusted? The only way to know for certain whethera horse needs an adjustment is with a chiropractic exam, where each joint is assessed individually by the doctor. That said, there are many things you can be on the lookout for that may suggest an underlying chiropractic problem. Horses will often pin their ears, grind their teeth, swish their tails or even buck under saddle in response to discomfort. Although these behaviors are sometimes considered training issues, they are often a sign of an underlying physical issue. Many subtle performance problems such as inability to lift the back, drive from behind or change leads smoothly can also be helped with chiropractic care. Routine chiropractic evaluations can identify small problems before they evolve into into overt lameness. When the horse's body is moving properly, inflammation is reduced, the nervous system can function optimally, and the horse is set up for success. In the spirit of Thanksgiving, I wanted to take a moment to share a quick story. For thepast year, I've made monthly visits to Raven Rock Ranch, owned by Tim and Sandy Matts, to provide pro-bono acupuncture services for the horses. The relationships forged on this ranch between at-risk youth and the re-homed/rescued horses are therapeutic for everyone involved. The place just has a wonderful energy. I've become a lot more sensitive to energy as I've shifted my practice from Western medicine to an Eastern approach to healing. Learning acupuncture has led me to slow down and to be much more observant of the subtle cues that horses use to communicate. I am incredibly grateful to have access to a modality that the majority of my patients really enjoy. Until I started Balanced Horse Vet, I hadn't realized how important it was to me that my patients enjoy their treatment, something which I rarely encountered when practicing Western medicine. Horses lining up for acupuncture! I don't always treat the same horses at Raven Rock Ranch, but I do have a couple that have become my regulars. At my most recent visit, the volunteers were redoing much of the fencing, so the horses were loose on the property, happily grazing on the front lawn. I had just started working on my first patient, when Rachel, one of my regulars, stopped grazing and wandered over to the barn. She came into the aisle and waited patiently. I was flattered that she had stopped her grazing to come say hi, and since she was there, I started working on her. A few minutes into Rachel's acupuncture treatment, Rocky, another of my regulars, stopped grazing and wandered into the barn to wait his turn. There were no treats or lead ropes involved; these horses just love their acupuncture! I was humbled that these kind creatures would leave their fresh green grass to come spend time with me. Every day, I am thankful that I can serve our four-legged companions in a way that fosters positive relationships. It's a rare vet that can say that her patients voluntarily line up to get poked with needles. If you are looking for a great cause to support both horses and children, you can find out more about the great work that Raven Rock Ranch does at www.ravenrockranch.org. What's the deal with ginseng? Many people are familiar with ginseng as a dietary supplement and an ingredient in many natural energy drinks. The root of the ginseng plant has been used in Traditional Chinese Medicine (TCM) for thousands of years. The ginseng route resembles a person. One autumn, thousands of years ago, two brothers were hunting on the mountain Chang Bai Shan. A sudden snow storm trapped them on the mountain. Unable to return home, they dug in the soil and discovered a large root, which became their only sustenance for the next five months as they waited for the snow to melt. The following spring, the brothers brought this root with them when they returned home. They were welcomed by villagers who had long thought them dead. The people named the special root “Ren Shen,” or “man root,” both because it looks like a person and because it helped sustain human life. Since then, it has been used in TCM to reinforce qi, the life force. Ginseng is found growing in the wild in both Asia and North America. Chinese ginseng (Ren Shen) and American ginseng (Xi Yang Shen) look similar but have slightly different properties and are used for different therapeutic purposes in TCM. While both serve to tonify qi, Chinese ginseng has warming properties while American ginseng helps to cool the body. Which form of ginseng is appropriate for a patient will depend on his presenting Chinese pattern or diagnosis. Do you know which of the five elements most influences your horse? According to traditional Chinese medicine's five elements theory, a horse is influenced in varying degrees by five elements: Wood, Fire, Earth, Metal and Water. Horses whose constitutions are strongly influenced by one element will tend to have medical conditions associated with the systems governed by that element. Many horses are influenced by multiple elements, but it can be fun to determine which element most aligns with your horse's personality. Below is a list of some of the traits associated with each element when the individual is in a healthy, balanced state, as well as the most common issues that arise when that element is out of balance. Do any of these sound like your horse? The main organ associated with the wood element is the liver. Wood governs the storage of blood, maintains smooth flow of qi, nourishes the tendons and ligaments and opens to the world through the eyes. The main organ associated with the fire element is the heart. Fire governs the blood vessels, houses the Shen (mind,) controls sweat and opens to the tongue. The main organ associated with the earth element is the Spleen. The earth element governs transporting and transforming functions in the body. It also controls the blood, muscles and limbs. The earth element opens to the mouth and lips. The main organ associated with the metal element is the lung. Metal governs qi and respiration. It regulates water passage, controls the body surface and opens to the nose. The main organ associated with the water element is the kidney. This element stores the prenatal essence (jing), governs the body water, controls the bones, urinary and reproductive systems, and opens in the ears. Having fun trying to figure out your horse? For more extensive reading on how the five elements align with personality types, please click here. Five Element theory (Wu Xing) is one of the founding principles of Traditional Chinese Veterinary Medicine, and dates back as early as the Yin and Zhou Dynasties (16th century B.C.E.- 221 B.C.E.). The five elements, Wood, Fire, Earth, Metal and Water, are used to describe the relationship between organs in the body and to guide clinical diagnosis and treatment. While it may sound strange to our modern ear, the ancient Chinese used analogies from nature and their own family structure to describe what they observed in the body. To appreciate how different systems operate in the body, we first need to understand two cycles of the Five Elements, the Sheng Cycle and the Ke Cycle. The Sheng cycle is a creation cycle. It illustrates how each element generates and nurtures the next, similar to the relationship between mother and child. Wood creates Fire: Wood is burned to make fire. Fire creates Earth: When fire burns, it leaves ash which creates earth. Earth creates Metal: The earth produces the ore from which we create metal tools. Metal creates Water: Water condenses on a metal surface. Water creates Wood:Water is vital to a tree's ability to grow and provide wood. The Ke Cycle is one of control, and describes how each element acts to restrain another. Wood controls Earth: Wood is used to mold the earth into a dam. Earth controls Water: A dam restrains the flow of water. Water controls Fire: Water is used to extinguish a fire. Fire controls Metal: Fire melts metal ore and allows it to be shaped. Metal controls Wood: A metal saw is used to harvest trees for wood. Wood is associated with the liver and gall bladder. The wood element also governs tendons/ligaments, hooves/nails, and eyes. Fire is associated with the heart, pericardium, small intestine and triple heater. Fire governs circulation, complexion and the mind (or Shen). Earth is associated with stomach and spleen. Earth is in charge of digestion and muscles. Metal is associated with the large intestine and lung. Metal is responsible for skin/hair coat and respiration. Water is associated with the urinary bladder and kidney. Water is responsible for elimination, reproduction, and the bones. By understanding how each of these systems relates to the others, we can develop treatment plans to address imbalances between them. Individual animals often have personalities or “constitutions” that align more with one element than others. Their dominant element may give clues to which conditions they are most likely to suffer. Please stay tuned for the next blog post where we will help you determine which element is most characteristic of your animal's personality! Why should you consider acupuncture for your horse? Acupuncture is very effective at relieving pain caused by arthritis, laminitis, tendon/ligament injuries, sore muscles and other causes of lameness. Acupuncture treatment causes a release of beta-endorphins and other neurotransmitters that can decrease pain and regulate inflammation. In a study of chronic back pain in horses, acupuncture provided significantly greater relief than bute (phenylbutazone)! Trailering and showing can be very stressful events for our equine companions. Whether your horse internalizes this stress, or is the type that wants to jump out of his skin in a new situation, acupuncture can help to calm your horses mind. Happy, relaxed horses perform better and develop fewer gastric ulcers! Acupuncture helps restore the body to optimal function. Whether recovering from an acute respiratory infection or managing a chronic medical condition such as heaves, acupuncture can be used along side Western medical treatment to speed recovery and improve life quality. By scanning reactive acupuncture points, a veterinarian can help identify subtle issues before they develop into clinical lameness or other serious problems. Regular acupuncture exams and treatment help keep your horse's physiologic systems running smoothly. For example, if your horse suffers from frequent colic episodes, acupuncture provides a tool for preventing the next episode, rather than waiting to treat it when it occurs. If you are curious how acupuncture could help your horse with a specific problem, Dr. Taryn Rathbone would be happy to provide a free consultation by phone or email to answer your questions. Do you know what the Yin-Yang symbol really means? Almost everybody has seen the yin-yang symbol, but few have taken the time to understand the complexity of its meaning. In designing the logo for Balanced Horse Veterinary Service, PLLC, I drew my inspiration from this symbol because it represents a philosophical view at the heart of traditional Chinese medicine. I encourage you to join me in taking a closer look at this classic symbol. To understand the complexity of its meaning, we must first understand the 5 principles of Yin-Yang. Yin represents things that are cooler, quieter, more still and darker. It is characterized by the color black. Example: Daytime is characterized as more Yang, whereas night is characterized as more Yin. A young boy would be more Yang, while an elderly woman would be more Yin. 2. 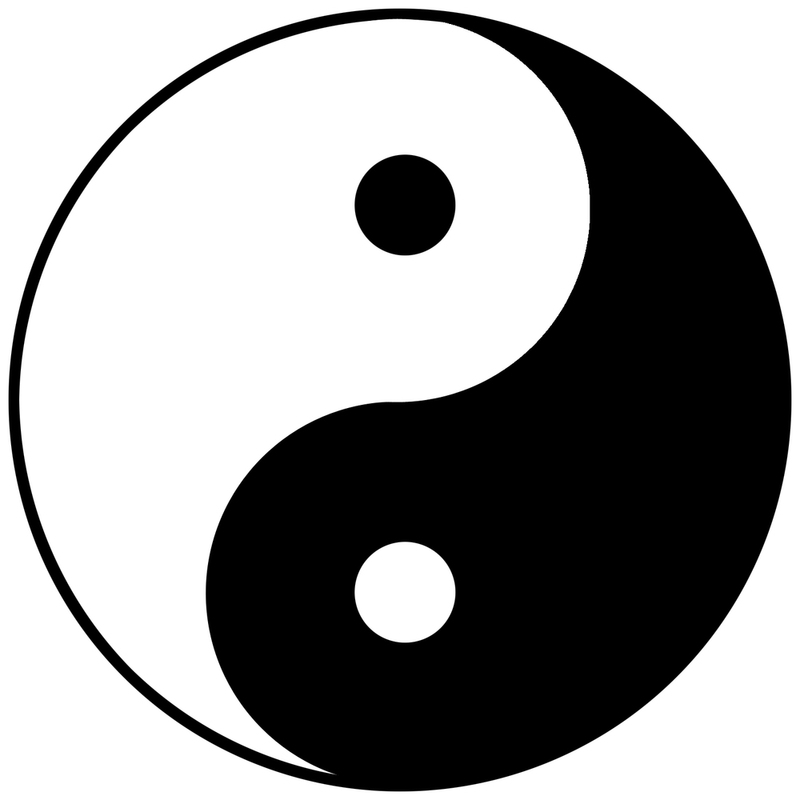 Any Yin-Yang division can be further divided into Yin and Yang aspects. The two opposite forces that compose everything in the universe are in constant struggle to regulate each other. Example: Heat (Yang) can dispel cold (Yin), but cold can also lower a hot temperature. Because Yin and Yang are defined as opposites of each other, each cannot exist without the other. Example: There can be no concept of cold (Yin) without an understanding of heat (Yang). Yin and Yang are not static. Under certain circumstances each may transform into the other. Example: Day (Yang) becomes Night (Yin), and night transforms into day. Summer (yang) transforms into winter (Yin), and winter into summer. As we look at the Yin-Yang symbol, we see these five principles represented. Within the black there is a little bit of white, and within the white there is a little bit of black. Nothing is all Yin or all Yang. As your eye follows the flow clockwise, the white becomes black, then the black becomes white. The balance of Yin and Yang in the body is critical to maintaining health. Disease can be described as patterns of excess or deficiency of Yin or Yang. My goal at Balanced Horse Veterinary Service, PLLC is to restore your animal's body to a natural state of Balance. What do Grandma and Mr. Ed Have in Common? Happy Birthday! With each year that passes, we grumble a little more about our aching backs, creaking hips and stiff knees, but do we ever stop to consider how aging effects our four-legged friends? Many of us have watched our older dogs slow down, avoid stairs and stop jumping on furniture. We often dismiss this as “he is just getting old,” but it is important to realize that these changes in behavior can be our pet's way of telling us that something hurts. Signs of pain in the horse are often even more subtle. A horse's instincts as a prey animal are to hide pain. With the exception of Mr. Ed the talking horse, it can be hard for horses to tell us exactly what is troubling them. Like humans, horses often suffer from arthritis and back pain as they age; they just complain about it differently. So how do you know if your horse is uncomfortable? Horses vary in how they express pain. While the sensitive ones may pin their ears and swish their tails when certain areas are brushed, when saddles are placed or when girths are tightened, more stoic animals may show only decreased performance under saddle. If your horse starts missing a lead change, knocking down rails or otherwise under-performing in the ring, it may be time to look closer. Too often, what is labeled as a training or behavioral issue is, in fact, the horse's response to physical discomfort. Your veterinarian can be of great help in determining the underlying cause. Even when a full lameness exam is unable to locate a cause of decreased performance, it may be helpful to have your horse's acupuncture points scanned by a veterinarian trained in acupuncture. A “scan” of the acupuncture points simply involves applying gentle pressure to a series of specific points on the body while paying close attention to the horse's response at each point. Specific patterns of reactive acupuncture points can help localize a problem. These non-invasive scans, which take only a few minutes to complete, are often sensitive to subtle musculoskeletal problems, even when the horse does not show an overt lameness. As horse people, we develop special partnerships with our equine companions. We depend on each other, and when we communicate well, we excel as a team. We are accustomed to telling our horses what we want. Next time you are in the saddle, I challenge you to take a moment to listen to your partner. Most veterinarians had their careers picked out by the age of seven; this is not my story. If you had asked me as a child what I wanted to do when I grew up, I wouldn't have known what to say. I was drawn to the idea of helping others, yet was hesitant to pursue the careers that had been modeled for me. Field trips to the firehouse portrayed firefighters as heroes, but I didn't really fancy running into burning buildings. Our local police force had a mounted unit, and I remembered wondering if there was any way to be one of the officers that got to ride a horse without having to perform the other parts of police work, like risking being shot. I guess I had a decent sense of self preservation. The idea of being a human doctor never really appealed to me either. Sure, doctors save lives, but my visits to the pediatrician usually ended with a needle in my arm, and somehow that didn't inspire me. Out on the trail, one of my favorite places to be! I was a late bloomer. The idea of going to vet school came to me my freshman year of college, and I owe it to my best friend. It was Thanksgiving day. We had all piled into the family minivan for the two hour drive to my aunt's house. At some point during the drive, conversation turned to what classes my friend and I were each taking. She mentioned something about animal science classes and that she was thinking about a career in veterinary medicine. I remember thinking two things. First, I was insanely jealous that my small liberal arts college didn't offer animal science courses. Second, would I be a total copycat if I decided to go to vet school? I began volunteering with local veterinarians to find out what life as a vet was really like. I soon discovered that being a good veterinarian was much more than diagnosing and treating a wide range of species. Good vets take on the role of teacher when explaining complex medical conditions and treatment options to owners. They are called upon as advisers when owners struggle with difficult decisions, and counselors when owners experience loss. The more I saw, the more confident I became that I finally had the answer to that question posed over a decade earlier. I knew what I wanted to be when I grew up. I couldn't get enough of it. I volunteered in small animal hospitals, rode along to farms with large animal vets and jumped at every opportunity to gain exposure to veterinary medicine. It was during those early years that I first saw a horse receive acupuncture. As someone who is not terribly fond of needles, the concept of acupuncture was a little hard to stomach. Why would anyone let someone put not just one, but a couple dozen needles in them? And how could this possibly be a good thing? The horses changed my mind. The nice thing about horses is that they don't lie. I watched horse after horse go from alert and slightly anxious to completely relaxed, with head held low and lip drooping, just minutes after acupuncture needles were placed. It's hard to argue a placebo effect when a horse resembles a pin cushion, but is so relaxed he looks like he's been given IV sedation. I promised myself I would learn how to do that someday. Many years later, not only can I produce these results in my patients, but I have also personally benefited from acupuncture treatments. I have the horses to thank for convincing me to give it a try. I love them in all sizes! I became a veterinarian because I wanted to help people. Don't get me wrong, I do love animals. One doesn't sit through four years of undergrad lectures followed by four years of intensive veterinary medical training just because puppies are kind of cute. A passion for working with animals is a prerequisite, and one that I was born with. The beauty of veterinary medicine is that it gives me the opportunity to assist animals in need, while simultaneously building relationships with their people. Too often, I hear people say that they want to become a veterinarian because they hate people. They've got it all wrong. Veterinary medicine is about teamwork. It's about finding the best course of treatment for an animal and his person in a given situation. If the owner isn't on board, treatment is bound to fail. So much of veterinary medicine is making sure that the humans are working together toward a common goal. There is nothing more comforting to an owner than to know that her vet is on her side.